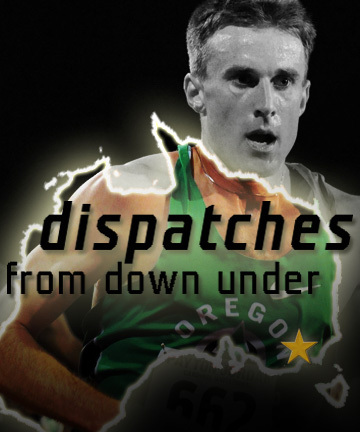 Matt Tegenkamp, Chris Solinsky, Tim Nelson and Andrew Bumbalough have journeyed to Australia for a fast, uber-competitive early season 5000m in Melbourne, Thursday March 3rd. During this week, we’re sharing some reports from them, and today, we turn to Twitter. I am with usain bolt… If I go to Australia and dont see a kangaroo I will be super bummed. And now the flight to Melbourne. Hope I can sleep! Good night, USA! Good Morning, Australia. Just arrived in Melbourne to discover that I now have cankles. Lovely. Just wrapped up my workout here in Melbourne with the guys. Was [a] rough feeling just getting off the plane yesterday, but still hit da splits. Finally have some sun today here in Melbourne. Gonna be a good day. Had a good time going to the Melbourne aquarium yesterday; saw sharks. Finally SUN here in Melbourne! Found out this is the wettest summer on record… I thought we left Portland? pre-race tune up. done. awesome pre-race meal. eaten. time to watch ‘The Town” and grab a magnum ice cream bar. RACE DAY!!! Slept in, coffee, toast, eggs; getting primed!! Finished breakfast @ Pancake Parlour. Having Amy here is great 4 company, but also great having extra food she doesn’t eat, to fuel my race! By the time you read this, we’ll be mere hours away from the gun going off. Watch the race live (at 5:03AM EST at http://wcsn.com.au/index.php/athleticstv.html — or follow along via kimbia’s own Twitter account, @kimbia.